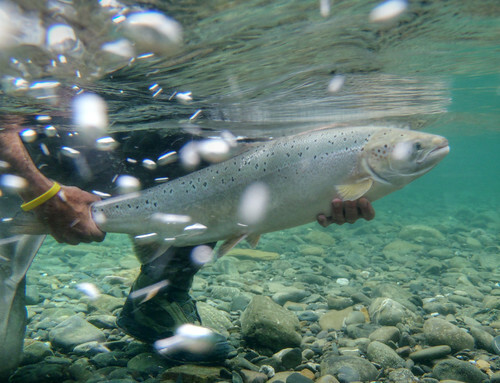 Are Atlantic salmon on the way back? North American anglers often think of Atlantic salmon populations as being in a perpetual state of decline, but higher numbers of wild Atlantic salmon and excellent water conditions are contributing to an outstanding fishing season in parts of Newfoundland, Labrador, New Brunswick, Quebec, and Nova Scotia. Fish-counting facilities on the rivers that provincial governments monitor to assess the number of salmon returns are showing numbers well above previous five-year averages. To understand the excitement of anglers who are experiencing firsthand the signs of a banner year, it is important to consider what has happened over the last few decades. The number of adult wild Atlantic salmon that spend two years at sea before returning to home rivers numbered about 900,000 in the mid 1970s. According to the International Council for the Exploration of the Sea (ICES), in just over two decades, salmon numbers fell by almost 90% to about 100,000. For those salmon, called grilse, that return to home rivers after only one year at sea, the decline in the same period has not been as steep, falling from 800,000 to about 400,000 to 500,000. Wild Atlantic salmon face daunting challenges to their survival throughout their traditional range. Over-harvesting in fisheries, dams, impacts from industry such as forestry, salmon farming, and changing environmental conditions in the ocean have resulted in a decline in populations to only 20% of their historic levels. The decrease in numbers of the large salmon that spend two or more years feeding at sea is especially troubling, as these fish are predominately female. Due to their large size at spawning, they carry a much larger number of eggs relative to the smaller grilse. It is these large fish that migrate from North America to feeding grounds off Greenland. The gin-clear waters of Gaspé rivers are probably the best place on earth to take underwater photos while releasing large Atlantic salmon. The decline in salmon numbers has not occurred evenly across eastern Canada. Many rivers, primarily in the southern range, have suffered the greatest losses. All wild Atlantic salmon in Maine have been listed as endangered under national legislation. In Canada, the Committee on the Status of Endangered Wildlife in Canada (COSEWIC) recently recommended endangered status for additional southern populations of wild Atlantic salmon, including the outer Bay of Fundy. 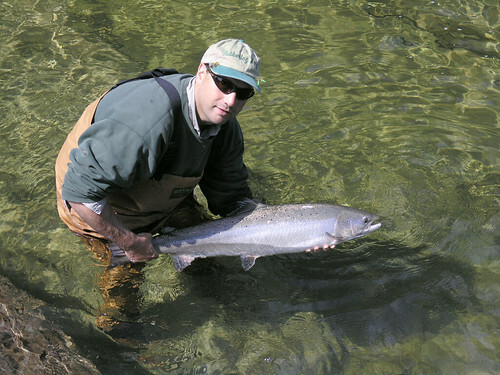 In 2010, anglers throughout Atlantic Canada raved about the amazing fishing, especially for grilse. Rivers like the Exploits in Newfoundland, which has a predominately grilse run, broke all-time records. This year, the rivers have been alive with both large and small salmon. Even the Penobscot River, one of the rivers listed as endangered in Maine, has seen the best run since 1986, with more than 3,000 returning fish. What’s making the difference? There are as many explanations as fishermen out there, but we can rest assured that a significant influence on the strength of runs comes from a conservation agreement with Greenland fishermen that has suspended their commercial fishery since 2002. The Atlantic Salmon Federation of the US and Canada and the North Atlantic Salmon Fund of Iceland established a fund that helped get the Greenland fishermen involved in alternative employment and fisheries, such as that for lumpfish. Certainly it stands to reason that when a fishery that had a quota to kill 60,000 large salmon in 2001 is stopped, then more salmon will make it back to their home rivers to spawn. Another big help has been the growing inclination of anglers to release their salmon— even when regulations allow retention. ASF’s affiliated organizations are also pushing government to reduce the number of tags available to anglers for retention. This groundswell of support for live release is ensuring that more salmon make it to the spawning grounds, return to sea, and come back as even bigger salmon to spawn. Releasing wild Atlantic salmon is an exciting prospect in the Gaspé rivers, where the clarity of the water allows anglers to watch salmon gracefully swimming away into deeper pools. Finally, it seems that the salmon’s survival at sea is improving. Whether this is due to improved temperatures, better forage opportunities, fewer predators, or a combination of factors is not clearly understood. The Atlantic Salmon Federation’s scientists carry out research that tracks salmon at sea to try and get a full comprehension of where, when, and why mortality occurs to inform management measures that will better protect the species. The ASF also works with Provincial and US affiliates to do hands-on work in rivers—keeping banks stable and fighting disruption of river habitat—and these restoration programs are paying off. A $50 million restoration project, being spearheaded by ASF and other conservation partners, on Maine’s Penobscot River to remove two dams and circumvent another promises to boost the celebrated run of more than 3,000 in 2011 to much higher numbers. All this hard work by the ASF has been well rewarded in the 2011 season. Reports from anglers, wherever they fish—the Miramichi and Restigouche in New Brunswick; the Matapedia, Bonaventure, and Grande Cascapedia in Quebec; the Margaree in Nova Scotia; the Sand Hill in Labrador; and the Humber in Newfoundland—all tell of the best salmon fishing they have ever experienced. 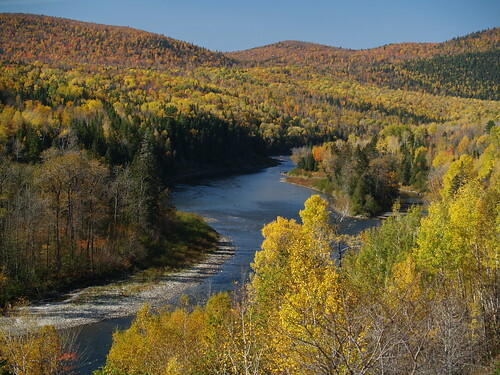 Crisp days in autumn bring another worldly beauty to the forest and winding Matapedia River. This is a time to get to know the river in an entirely new way. It is too early to tell if the runs of 2010 and 2011 are the norm for the future. If they indeed are, then it just might be possible to restore salmon to something approaching historic runs. Good runs often mean more people want a piece of the action, though. To restore the runs permanently, we must stay the course, making sure as many salmon get to the spawning beds as possible. Greenland fishermen are seeing a lot more salmon off their coast, and, in negotiations on quotas at the North Atlantic Salmon Conservation Organization (NASCO), they are demanding a return to their commercial fishery. Catch-and-release angling is working and needs to continue and grow as a practice. The challenge is to keep harvest down and habitats healthy. Only if that challenge is met will the King of Gamefish continue its brilliant comeback of the past two years. If you would like to participate in that comeback, you may donate to and check out the work done by Atlantic Salmon Federation. Charles Gaines is a world-renowned writer and outdoorsman. Among his many works, he is co-author of Leaper: The Wonderful World of Atlantic Salmon with Monte Burke. ← CITES Aims to Protect America’s Largest Aquatic Salamanders.